Vietnam had a baseball National Team participating in the South East Asia (SEA) Games (a biennial multi-sport event that began in 1959) in 2011. The Country first hosted the SEA Games in 2003 and is the confirmed host for the 2021 SEA Games. The other 10 Nations participating in the SEA Games are Brunei Darussalam, Cambodia, Indonesia, Laos, Malaysia, Myanmar, Philippines, Singapore, Thailand, and Timor Leste. In the 2019 edition of the SEA Games (this year in December) to be hosted by the Philippines, men’s baseball, and both men’s and women’s softball will compete. 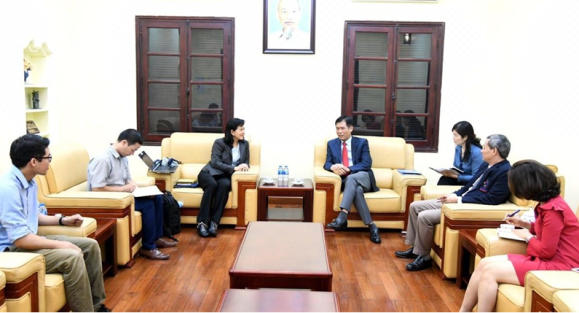 Beng Choo Low traveled to Vietnam to meet the National Olympic Committee Secretary General Tran Van Manh. Together they then met Vietnam Sports Administration Vice President Doctor Tran Duc Phan and his assistant Luyen Rhi Hong Hanh. “Doctor Tran Duc Phan is no stranger to the game. He played baseball in Japan.” added Beng Choo Low “We had some good discussion and shared the idea of reviving baseball development　and introducing softball and Baseball5 in Vietnam.”The Vietnam Sports Administration and the National Olympic Committee are ready to start the process to establish a National Baseball Softball Federation. WBSC will send to the Sports Administration manuals and starter’s kits to help introduce the game in schools. Beng Choo Low, who brought with her a Baseball5 starter’s kit, agreed to assist Vietnam in organizing a seminar for physical education teachers in Hanoi. The tentative date is July 2019.